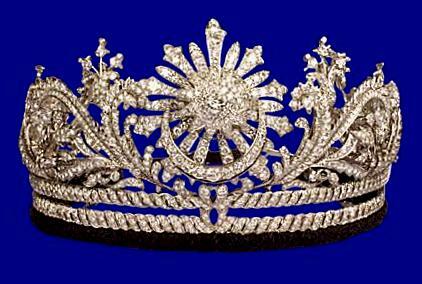 The trademark tiara of the Queens of Malaysia is known as the Gandik Diraja. Crafted from platinum and diamonds, it incorporates several traditional motifs: a central star with a crescent and the swiriling “awan larat” design. The current version was remounted from a previous diadem by Garrard in 1984 and is designed to break down into a locket and set of brooches. Malaysia has an interesting version of monarchy in which the rulers of individual royal Malay states are elected to be the king (the Yang di-Pertuan Agong) of the whole country every 5 years. This tiara is part of the crown jewels of Malaysia and as such is passed from queen (Raja Permaisuri Agong) to queen, rather than remaining in anyone’s personal collection. It’s worn for the installation of a new Yang di-Pertuan Agong as well as for the most formal of ceremonial occasions. 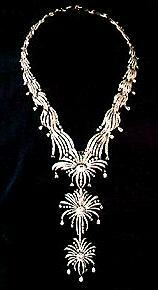 Queens also have a necklace from the crown jewels to pair with the tiara. 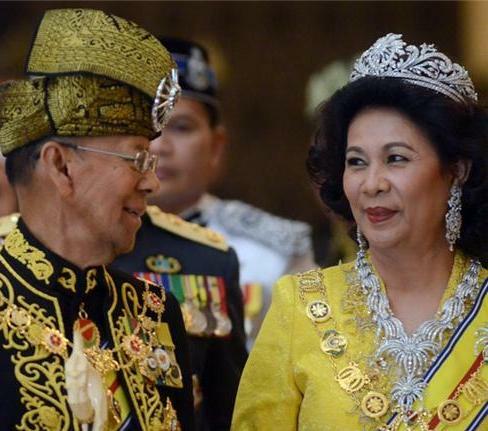 Called the Kalung Diraja, it – like the tiara – is made from platinum and diamonds and its waterfall design can dismantle to form a variety of ornaments like earrings and brooches. It was made by Garrard in 1989. What do you think: is the Gandik Diraja a jewelry success?